It’s no mystery that business-to-business (B2B) marketing is constantly changing—it’s specifically how it’s changing that may come as a wake-up call for some companies. For starters, let’s walk through a typical scenario. You’re a marketer and buyer of analytic services for a mid-sized company, and your boss comes to you frustrated with the current traffic solution and wants to find something new. The problem is, the budget for monitoring and reporting analytics can only increase by 10 percent this year. What do you do? Well, most likely, you start with the Internet (89 percent of B2B research starts online). You begin with some branded searches from vendors you’ve heard of or met at conferences. Then some generic searches to identify who the big players are and who’s making headlines—on average, B2B researchers will perform twelve searches prior to visiting a specific brand’s site. You fall further down the rabbit hole when you begin to find well-respected voices in the reporting and analytics community. Blogs, forum posts, case studies, and testimonials are all shaping your opinion as you find a few vendors that can fulfill your needs. You invite them to present and go with the lowest bid. Problem solved. This all seems pretty standard, right? Well, if you’re a B2B marketer, you certainly noticed that nearly the entire sales process happened without the input of a single salesperson. Self-directed research and learning helps customers form opinions, learn technical specifications, build requirement lists, and ultimately narrow down their options—all with little to no influence from sales. In fact, research shows that buyers don’t contact a supplier directly until 57 percent of the purchasing process is complete. This means that more than half of the sales cycle has been stripped from sales and is now in marketing’s hands. According to a study published by Google and Millward Brown, a global branding and marketing research company, the average age of B2B buyers and researchers has dropped significantly. 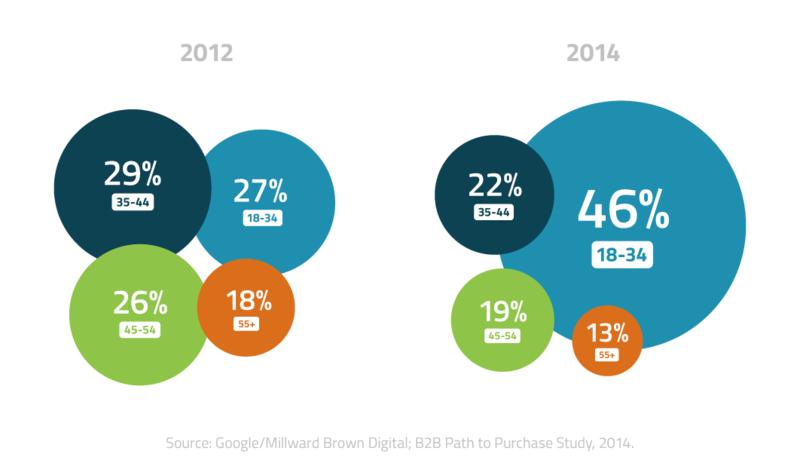 Only 27 percent of the employees buying B2B products were between the ages of 18-34 in 2012. In 2014, however, that number increased to 46 percent. That’s the millennial generation—men and women who reached adulthood around the year 2000. While 64% of the C-suite have final sign off, so do almost a quarter (24%) of the non-C-suite. What’s more, it’s the latter that has the most influence; 81% of non-C-suiters have a say in purchase decisions. How do you reach a younger audience online and stay at the front of a potential client’s mind and search results? The answer is savvy content strategy presented at critical points along the sales funnel. Buzzsumo recently published its guide to “The Best B2B content of 2015” to get the ball rolling. Over two-thirds of B2B buyers watch online videos throughout their path to purchase—a 52 percent increase over the past two years. And it’s not just a few minutes, either. Nearly half of buyers watching videos viewed over thirty minutes of content, with 20 percent of those watching over an hour of content. What’s in these videos? The majority of videos watched were about product features, how-tos, and professional reviews. To reach this expanding audience more effectively, you need to be delivering content-rich video and mobile experiences to keep both researchers and buyers engaged throughout the entire path to purchase. B2B Marketing Has Changed. Do You Know Who Your Audience Is?